Two individuals dominated the 20th century with their example of nonviolence when battling states that were armed to the teeth. The first was Mahatma Gandhi who successfully took on the might of the British raj and the other was Nelson Mandela who fought against apartheid. Mandela became the President of South Africa while Gandhi shunned getting involved in politics. Eventually, the Mahatma – who was concerned about protection for Muslims – was killed by a Hindu fanatic. 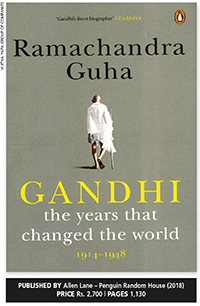 In his monumental work, Ramachandra Guha looks beyond the immediate impact of Gandhi to reveal details that provide a better understanding of what the Mahatma achieved. Gandhi’s intentions were sometimes confusing. For instance, he wanted the Harijans (India’s untouchables) to be free to use wells and land but didn’t oppose the caste system. In this epic containing 1,130 pages, the second part deals with Gandhi’s life and the period following his return to India from South Africa. He was a mature man whose experiments with nonviolence and Satyagraha in South Africa helped in his determination to free India from the British. Gandhi was successful in gathering a coterie of leaders including Jawaharlal Nehru who became the first prime minister of an independent India in 1947. But unlike Mandela, Gandhi did not seek political leadership. Guha comments that the bond “came very close to” being consummated sexually until Chakravarti Rajagopalachari, who later became India’s first Governor General, advised Gandhi to withdraw as it would bring him “unspeakable shame and death.” Interestingly, when Gandhi wrote his autobiography titled ‘The Story of My Experiments with Truth,’ he chose not to refer to Sarala Devi. To Mahatma Gandhi, securing India’s independence was only one issue. He also had to face Muhammad Ali Jinnah’s wrath wherein the latter insisted on partitioning India and creating Pakistan. While Gandhi was concerned about the safety of Muslims and undertook fasts for communal harmony, it unveiled other issues like that of the Hindu right, which claimed that all Muslims must leave the country after the Partition of India. Gandhi’s exhortation for all Indians to live in harmony fell on deaf ears. While India gained independence, circumstances were created where people suffered – wounds that continue to bleed even today. Guha also notes that there was disenchantment with Gandhi’s concept of religious pluralism. Ambedkar, who represented the Harijans, was keen on reforms while Gandhi insisted on a change of heart. Gandhi opened up roads and wells for Harijans to use but didn’t interfere in the caste system, which created the problem in the first place. Since there was no caste discrimination in Buddhism, Ambedkar wanted his people to become Buddhists. But it made little difference in a society where caste is a powerful force. In that respect, Gandhi’s exhortations about a change of heart would have been more powerful if his life had not been snuffed out. There is much that Sri Lanka can learn from the tragic events that unfolded post-Partition, as our recent experiences in the Kandy District and Aluthgama bear testimony to. Wrong decisions by politicians who eye votes and not the wellbeing of all races could lead to another tragedy. Guha says that Nehru’s standing has been eroded, which happened at the same time that the power of the Congress Party and the Gandhi family started to wane. The author has studied many documents not perused by others and presents a new detailed picture of Mahatma Gandhi. But has it come too late – at a time when Prime Minister Narendra Modi is moving away from Gandhi’s philosophy?